Spaghetti and Meatball Pot Pie Recipe - baked spaghetti and meatballs with a pizza dough crust - flip over for a fun way to eat pasta! Kids love this!!! 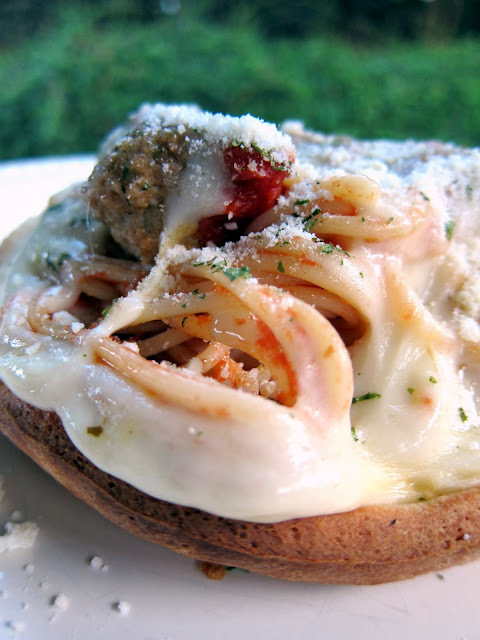 Great way to use up leftover spaghetti and meatballs. A few weeks ago I posted my version of Pizza Pot Pie. We loved it! It was a great change to pizza night. I was going through my Google reader last weekend and noticed Chris' post on Nibble Me This for Spaghetti and Meatball Pot Pies. Genius!! We had to give it a try. It was fantastic and so much more fun to eat than regular spaghetti and meatballs! This is really simple to throw together. I used frozen meatballs and refrigerated pizza dough. The most time consuming part of this meal was boiling the pasta. Can't beat that! Give this a try on your next spaghetti night. Thanks for the inspiration Chris! Cut 6 circles of dough about one inch larger than ramekin or bowl - you will need to cut 3 circles and re-roll the dough and cut 3 more circles. Boil spaghetti according to package directions. Drain and toss with marinara sauce. Spray ramekins with cooking spray. Place 3 slices of mozzarella in each ramekin - one on the bottom and split the other two to cover the sides. Put 5 meatballs on top of cheese and top with pasta (enough to fill ramekin). Spray the outside of the ramekin with cooking spray, then stretch a round of dough across the top and let hang over the edge. Brush dough with olive oil and sprinkle with Italian seasoning if desired. Bake for 15 minutes until dough is golden. Invert each pot pie onto a plate and lift off the ramekin. I bookmarked Chris' as well and yours looks equally delicious. This is awesome! My kids will love this fun to eat twist spaghetti. I can't wait to try it. I'm not even sure how I came across your site, but I LOVE IT!! I'm always looking for new meals to try and have printed several of yours!! You're doing a fantastic job - keep it up!! Adorable kitty's, by the way!! Looks good! My hubs would like an all meatball pie. One of the most creative dishes I have ever seen. Fantastic and so trying this out for my son. He would love it! Question - I sprayed the non stick spray..but the cheese stuck bad and wouldn't come out..Any idea what I did wrong? Did you use fresh mozzarella or low moisture slices?? Otherwise it was an awesome dinner! Betsy - I sprayed the heck out of the ramekins with Pam. I use regular low-moisture mozzarella slices - I've used both Publix brand and Land O'Lakes and neither of them stuck. You could try greasing the ramekins with Crisco - that might help with the sticky cheese. Also - don't let the ramekins cool for more than a few minutes. They need to be hot to get the cheese out. U sure did wonderful with ur frozen meatballs! Thanks Steph! I did use the Publix brand slices and high temp Pam. Crisco is a good idea. I love pies!! Thanks for this wonderful recipe. Ive been worrying that I can't put good harmony between pasta and pie.